Holiday Gift Alert! 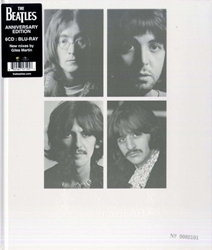 Music Review: The Beatles - The Beatles (aka The White Album) . Beatles Radio: The Beatles, Solos, Covers, Birthdays, News The Fab 4 and More! Most Beatles fans have played the game before, possibly many times: what would you trim from The Beatles' 1968 double album (aka the 'White Album') in order to make it a more compact, single album? Producer George Martin was very vocal in the decades after The Beatles was released in his strong belief that, had what he perceived as the weaker cuts been omitted, the album could've been a masterpiece. That's not to say a great many people don't consider it just that in its released form, but the late Sir George deemed it less than the sum of its parts. Of course the fascinating part of taking the "single-disc version of the White Album challenge" comes from fans' seeming inability to ever agree on what the definite lineup would be. (I'll indulge by offering my own personal tracklist at the end of this review.) The monumentally important news for Beatles people is that this holiday season, fans can not only argue about which 'White Album' tracks are the most vital, but which of the famous "Esher Demos" and studio outtakes are indispensable. Universal Music Enterprises has just followed up last year's super-deluxe Sgt. Pepper's box set with a 50th anniversary reissue of The Beatles.